Snow covered Mt Feathertop and The Razorback from Hotham Heights early in the morning. Described as 'Queen of the Victorian Alps' Mount Feathertop (1922m) has been the region's most popular alpine hiking destination for well over 100 years. In 1854, on the heels of the miners, Government Botanist Ferdinand von Mueller ascended Mt Feathertop. After von Mueller, the Bright Alpine Club formalised the destination with a winter ascent in 1889. The second highest peak in Victoria (after Mt Bogong), this track provides walkers with the most spectacular views in the State. This image belongs to the travel and nature stock photo library. This stock photo of Mt Feathertop and The Razorback in Winter is available for licensing for commercial and editorial uses including websites, blogs, books, magazines, brochures and advertising. Restrictions may apply for images which contain third party copyrighted material or sensitive subjects. Photos of artwork are for editorial use only. 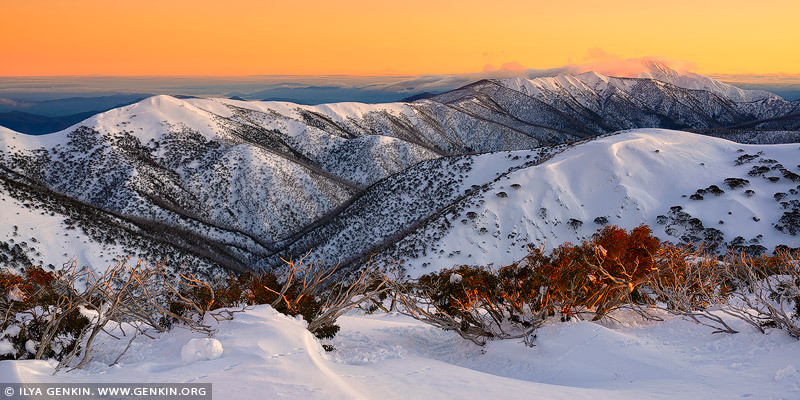 This image id AU-MOUNT-HOTHAM-0002 of Mt Feathertop and The Razorback in Winter, is copyrighted © by Ilya Genkin. This is not a public domain image.